Shared Projects let you write common code that is referenced by a number of different application projects. The code is compiled as part of each referencing project and can include compiler directives to help incorporate platform-specific functionality into the shared code base. Shared Projects (also sometimes called Shared Asset Projects) let you write code that is shared between multiple target projects including Xamarin applications. They support compiler directives so that you can conditionally include platform-specific code to be compiled into a subset of the projects that are referencing the Shared Project. There is also IDE support to help manage the compiler directives and visualize how the code will look in each application. If you have used file-linking in the past to share code between projects, Shared Projects works in a similar way but with much improved IDE support. What is a Shared Project? Unlike most other project types a shared project does not have any output (in DLL form), instead the code is compiled into each project that references it. This is illustrated in the diagram below - conceptually the entire contents of the Shared Project is "copied into" each referencing project and compiled as though it was a part of them. 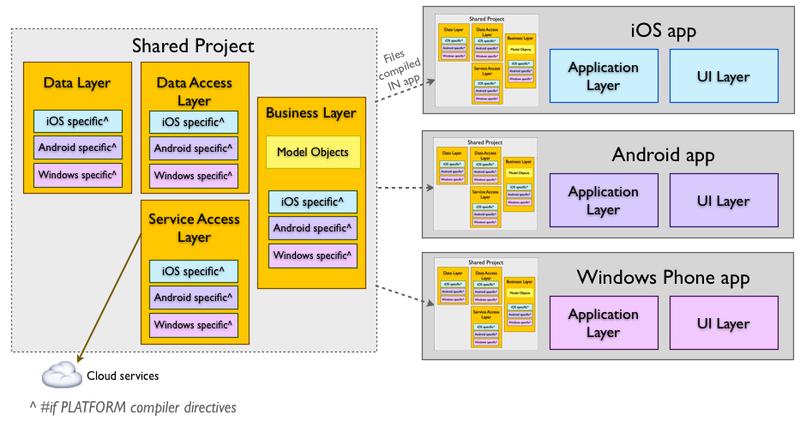 The code in a Shared Project can contain compiler directives that will enable or disable sections of code depending on which application project is using the code, which is suggested by the colored platform boxes in the diagram. A Shared Project does not get compiled on its own, it exists purely as a grouping of source code files that can be included in other projects. When referenced by another project, the code is effectively compiled as part of that project. Shared Projects cannot reference any other project type (including other Shared Projects). Note that Android application projects cannot reference other Android application projects - for example, an Android unit test project cannot reference an Android application project. For more information about this limitation, see this forum discussion. 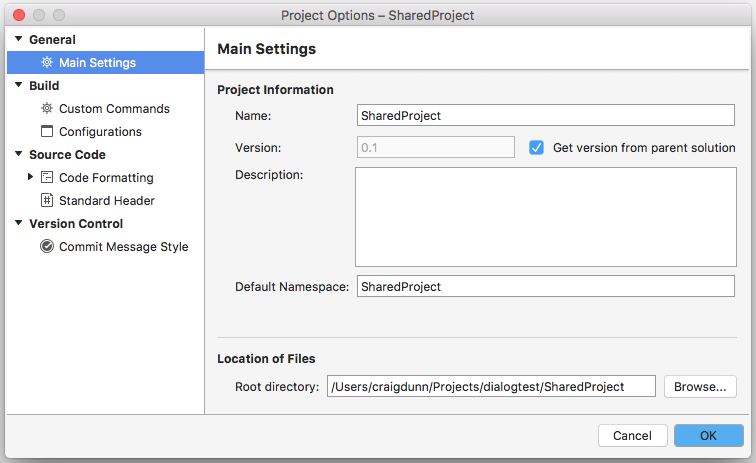 This section walks through how to create and use a Shared Project using Visual Studio for Mac. Refer the to Shared Project Example section for a complete example. On the next screen, choose the project name and click Create. A new Shared Project is shown below - notice there are no References or Component nodes; these are not supported for Shared Projects. For a Shared Project to be useful, it needs to be referenced by at least one build-able project (such as an iOS or Android application or library, or a PCL project). A Shared Project does not get compiled when it has nothing referencing it, so syntax (or any other) errors will not be highlighted until it has been referenced by something else. Adding a reference to a Shared Project is done the same way as referencing a regular Library project. 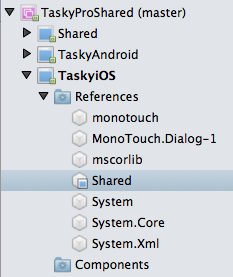 This screenshot shows a Xamarin.iOS project referencing a Shared Project. Once the Shared Project is referenced by another library or application you can build the solution and view any errors in the code. When the Shared Project is referenced by two-or-more other projects, a menu appears in the top-left of the source code editor that shows choose which projects reference this file. When you right-click on a Shared Project and choose Options there fewer settings than other project types. Because Shared Projects are not compiled (on their own), you cannot set output or compiler options, project configurations, assembly signing, or custom commands. The code in a Shared Project effectively inherits these values from whatever is referencing them. The Options screen is shown below - the Project Name and the Default Namespace are the only two settings that you will generally change. 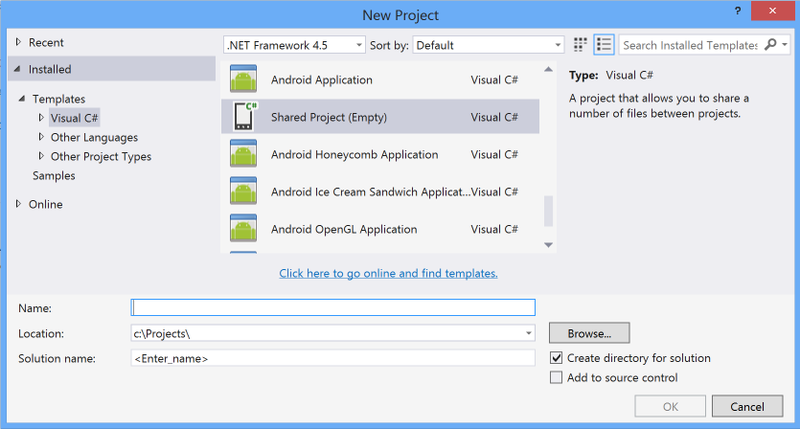 This section walks through how to create and use a Shared Project using Visual Studio. Refer the to Shared Project Example section for a complete implementation. To create a new Shared Project navigate to File > New Solution... and choose a name for the project and solution. You can also add a new Shared Project to a solution by right-clicking on the solution file and choosing Add > New Project.... A new Shared Project looks as shown below (after a class file has been added) - notice there are no References or Component nodes; these are not supported for Shared Projects. Once the Shared Project is referenced by another library or application you can build the solution and view any errors in the code. When the Shared Project is referenced by two-or-more other projects, a menu appears in the top-left of the source code editor to see which projects reference the current code file. When you select a Shared Project there fewer settings in the Properties panel than other project types. Because Shared Projects are not compiled (on their own), you cannot set output or compiler options, project configurations, assembly signing, or custom commands. The code in a Shared Project effectively inherits these values from whatever is referencing them. The Properties panel is shown below - the Root Namespace is the only setting that you can change. 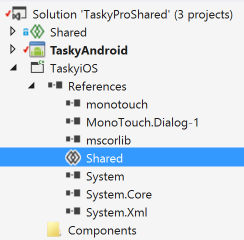 The Tasky example uses a Shared Project to contain the common code used by both the iOS, Android and Windows Phone applications. Both the SQLite.cs and TaskRepository.cs source code files utilise compiler directives (eg. 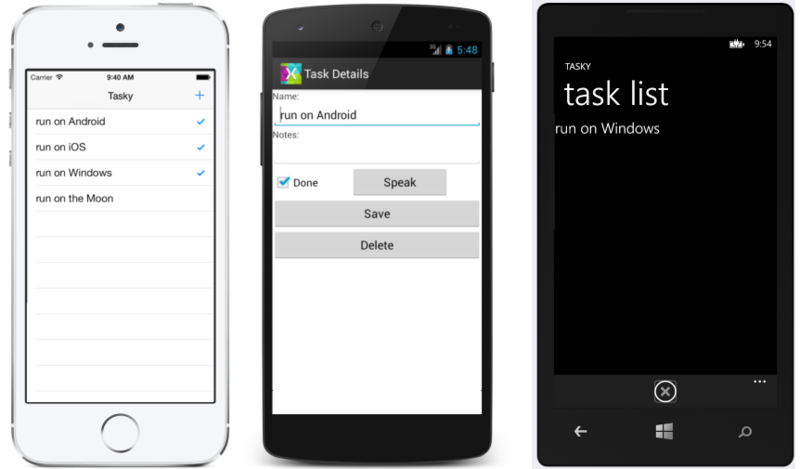 #if __ANDROID__) to produce different output for each of the applications that reference them. The Windows Phone project can be navigated from within Visual Studio for Mac, even though that project type is not supported for compilation in Visual Studio for Mac. This document described how Shared Projects work, how they can be created and used in both Visual Studio for Mac and Visual Studio, and introduced a simple sample application that demonstrates a Shared Project in action.